Best practices have become a major force in all sectors and industries, with managers and clients alike assuming that proper application of behaviors and processes deemed “best practices” will automatically lead to desired results. The reality is more complex and nuanced. What is a “best practice”? How do you communicate it from one team or project to the next? Is it possible to conform to “best practices” while being sensitive to context? In this first of a three-part series, PASS consultant Brian Ursrey and PASS Advisory Board member Andrea Bednar “get into the weeds” comparing their experiences helping organizations and companies implement industry best practices. Brian Ursrey: I work with a lot of non-profits, and there is a strong desire to adopt industry “best practices,” be it for principal gift fundraising, gift processing, or donor stewardship. There is this idea that there is a “best” way of doing these activities which would be uniform across the industry. What do you see as the factors driving an organization to adopt best practices? Andrea Bednar: In my own experience and with companies I’ve worked with, particularly having done a lot of work in the oil and gas industry, they adopt best practices because these practices are the ones that lead to the results they want to have. A lot of the companies have very similar businesses, just with different people, so they can copy quite easily. That’s true in a lot of industries. Brian Ursrey: But is copying behaviors or processes enough? I think there are any number of factors that go into achieving positive results, with the “best practices” just being one of them. Andrea Bednar: Yes, there’s a little bit of a fallacy—though I don’t know if fallacy is really the right word, maybe shortsightedness or just not investigating thoroughly—because there are usually a number of factors that go into having something actually work, regardless whether it’s manufacturing or a consultancy or a service provider, perhaps even not-for-profit. Organizations frequently assume that because we implemented one or more “best practices,” that is the reason for the similar results. We assume cause and effect. However, we don’t know, because there’s usually not enough investigation to find out what other factors are at play: Was it how they hired people? Was it people’s longevity with the company? Was it the attitude the workers had? Was it how much sleep they had the night before? How much do these factor into achieving results? Then the second shortsightedness is not crafting a well-stated or well-crafted practice. Let’s say, in this case, the idea of the best practice is the manager signing off on a repair job to say it was done well. When other companies go to implement this best practice, they say, “Okay, we have to have manager sign off on every job,” but is it really every job? What does “sign off“ mean? Brian Ursrey: Does it just mean a signature, or does it mean they actually verified that what was done was what needed to be done? Andrea Bednar: Right—that’s the ambiguity I’m referring to. Brian Ursrey: I see that in the non-profit world, where we implement a policy. An example would be the manager needs to sign off on every job, but they forget the purpose of the sign-off. What they end up doing is they just sign off, saying, “I signed off, that’s what I needed to do.” However, in fact, the actual best practice is making sure that the job is done, is done appropriately, and is complete. The signing it is not the best practice, the checking the work is the practice. Andrea Bednar: That’s something important, that understanding and clarity. Even though it seems kind of pedantic, that clarity is what really makes the best practice actually work. In your example, signing off isn’t just writing a name. The practice might be touching the pieces, or the steps. Or the practice could be that three times per day each manager will confirm the work with those doing repair jobs and the person doing the job will iterate aloud what they actually did at each stage. Now, that’s a really long-stated practice, but some practices actually need that kind of detail. And one of the things I see in terms of implementing best practices is that people don’t implement a practice, they implement or they attempt to implement an idea. Brian Ursrey: In some of my experience there’s a hesitance to go into that level of detail and clarity, because I frequently hear, “We don’t need to get that deep in the weeds.” I hear that phrase a lot when discussing making changes and implementing measurements. Going to what you’re saying, if we don’t actually talk about the specific practices that we’re trying to implement, we’re only implementing an idea, and that idea could be different things to different people. Andrea Bednar: And different for the same people on different occasions. One of the distinctions here is that policies might not need to be quite so “in the weeds,” but what about the practice? Because the practice and the policy are two different things. People collapse all kinds of things as if they’re one and the same. Policies, practices, ideas, checklists, best practices versus concepts, all of those things are collapsed as if they’re the same thing, and they’re not. But, back to that expression “get into the weeds” – where does that expression come from? When we say “get into the weeds,” we’re saying “get into too much detail,” usually, right? Andrea Bednar: Designing a well-crafted practice is not the same as getting into the weeds. That’s another place where people collapse things together, like, “Oh, we’re not going to get in the weeds.” Okay, but if you want to practice, practices aren’t the weeds. A practice is “how much dirt is there going to be in the pot that you’re going to plant the weed in?” That’s the practice. Brian Ursrey: You and I understand that distinction, but what’s the best way to explain that to someone else? However, a better expression here could be, “the devil’s in the details,” but the success is in the details, too. That’s the part I think people just don’t get. This is the point of being really specific about exactly what the practice is, and part of the reason people do not like the specificity is because with specificity comes accountability. Brian Ursrey: That’s probably the best way I’ve heard it explained: the success is in the details. 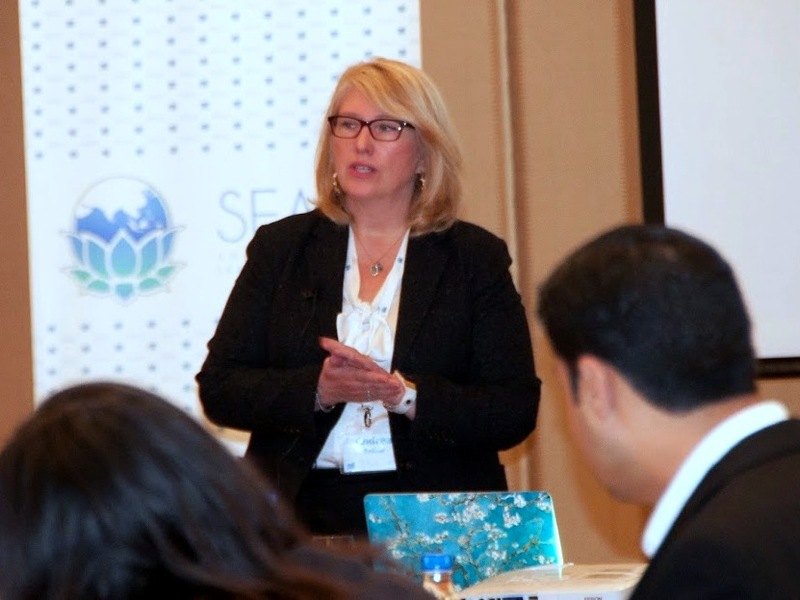 Cover image: Andrea Bednar facilitating at the South East Asia Leadership Academy (SEALA). Andrea Bednar is a PASS Advisory Board member and founder/CEO of PoP Associates. You can follow her writing on conscious business leadership at Instagram, Twitter, and LinkedIn. No Replies to "BEST PRACTICES, PART I: SUCCESS IS IN THE DETAILS"